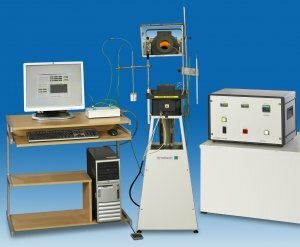 The FTT non-combustibility apparatus has been designed with significant new features. FTT has automated the control process by using modern electronics, and replaced the traditional variac, which can supply too high a current to the heater element during the heating cycle. This will considerably extend furnace life and has other benefits, including: soft start, ramp rate, power limit and an over-temperature device. Manufactured from steel with a polished finish. This single zone furnace has a maximum operating temperature of 900EC. The furnace is easily replaceable during maintenance and servicing procedures. A 19″ instrument case houses all the instrumentation. This unit features a temperature controller, an over-temperature alarm and a power controller, which control the furnace temperature at 750EC, compensating for supply voltage fluctuations and displaying the power (Watts) being supplied to the furnace. The software is a Windows-based application with simple push button actions, data entry fields, check boxes and other standard operations. The operator can monitor temperatures on a Status panel before performing a test without recording any data. Before a test, the specimen information (material name, density, mass, laboratory name etc.) is entered into the computer and saved to a file. During a test, temperatures at the furnace, temperatures at specimen surface and specimen center thermocouples are recorded at a rate of 2 Hz (i.e. two per second) and displayed on a graph in real time. Initial, maximum and final temperatures recorded by all three thermocouples are also displayed during the test run. After the test, the user is prompted to enter any comments about the material performance, the total time of sustained flaming and the final mass. The appropriate temperature rises are calculated and then a report for the test specimen can be generated. standard and states whether the specimen meets the criteria. The test data is saved is saved as an ASCII file which can then be imported into spreadsheets for additional analysis.